A few weeks ago I wrote about the fate of the former City or Great Synagogue of Vilnius that was damaged during World War II and subsequently demolished and for which excavation plans are now made. For those who do not know Vilnius, it is important to know that not far from the site of the old City Synagogue and the Shulhoyf is the impressive and still extant and active Choral Taharat Ha-Kodesh Synagogue at 39 Pylimo Street, erected by the “progressive” congregation of the maskilim outside the old Jewish neighborhoods (and subsequent Nazi-imposed ghettos). This location is one reason for its survival. Today, the Choral Synagogue is the sole functioning synagogue in Vilnius and one of only a small number of recognizable synagogue buildings in a city, known as The "Jerusalem of Lithuania," that held approximately 160 synagogues and prayer rooms before the Holocaust. 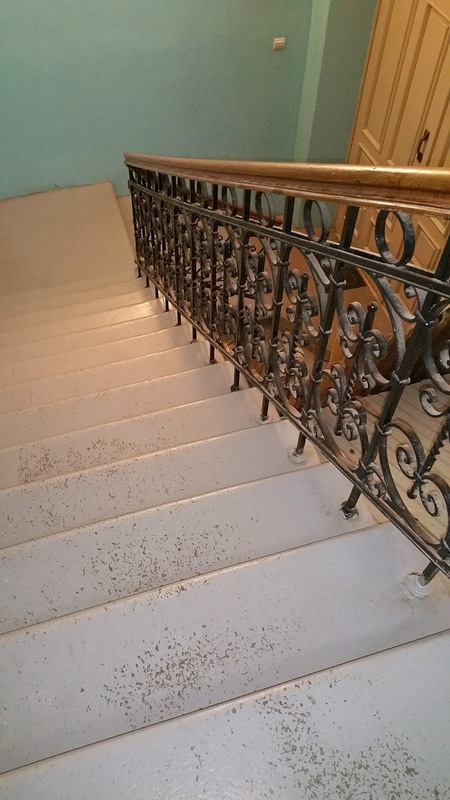 The building underwent significant repairs from 2008-2010. These were sponsored by the Jewish Community of Vilnius with support from the Jewish Heritage Program of the World Monuments Fund and other donors. Substantial work was done on the roof, dome, windows and the entire exterior water handling system and many repairs to unseen sections of the building. 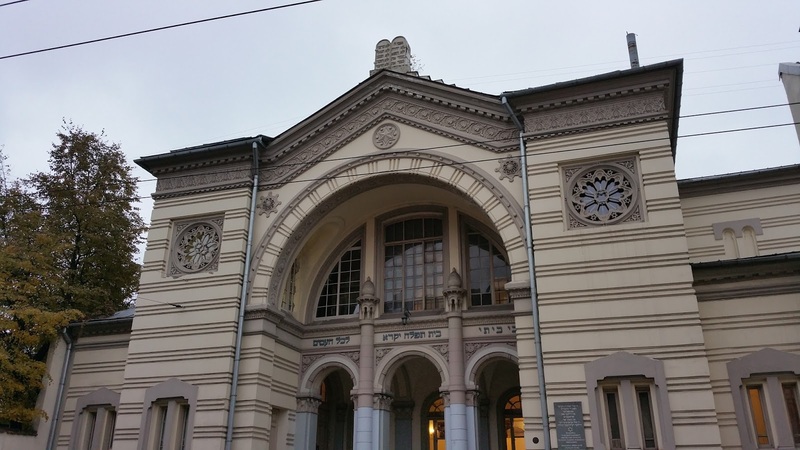 The synagogue occupies an ample lot on a major street just outside the historic center, but is very much part of Downtown Vilnius today. Despite its origins, the synagogue now is the home of a congregation that follows a traditional Litvak Orthodox minhag (liturgy). The main change to the worship space has been the addition of a free standing bimah set in front of the previously combined bimah and Ark platform. 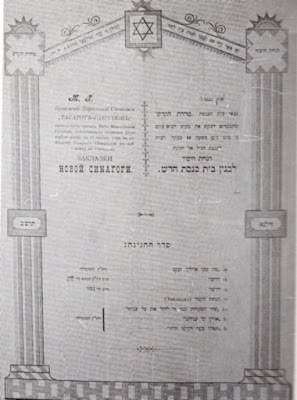 Despite strong opposition from traditional religious authorities, by the mid-19th century the maskalim congregation was well established and obtained official permission for a synagogue, which was inaugurated in May 1847 in the presence of the provincial governor. This synagogue, or congregation, however, had no permanent home and moved several times to different houses. The Taharat Ha-Kodesh differed greatly from other Vilnius kloyzn especially because of its emphasis on orderly prayers and a neat appearance. 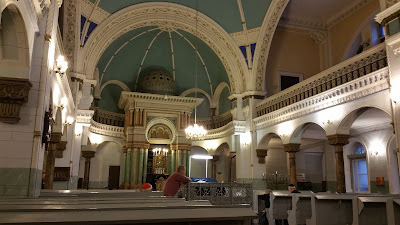 The prayers were accompanied by a choir; and the synagogue in its various homes was commonly referred to as the Choral Synagogue (khor-shul in yiddish). 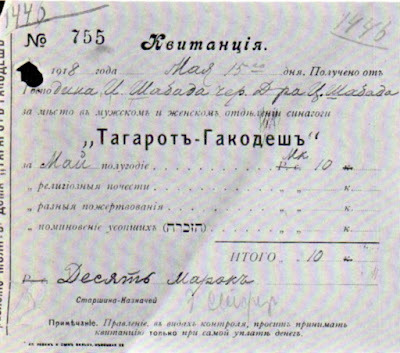 Special attention was given to regular preaching, at the beginning in German and since the late 19th century – in Russian. 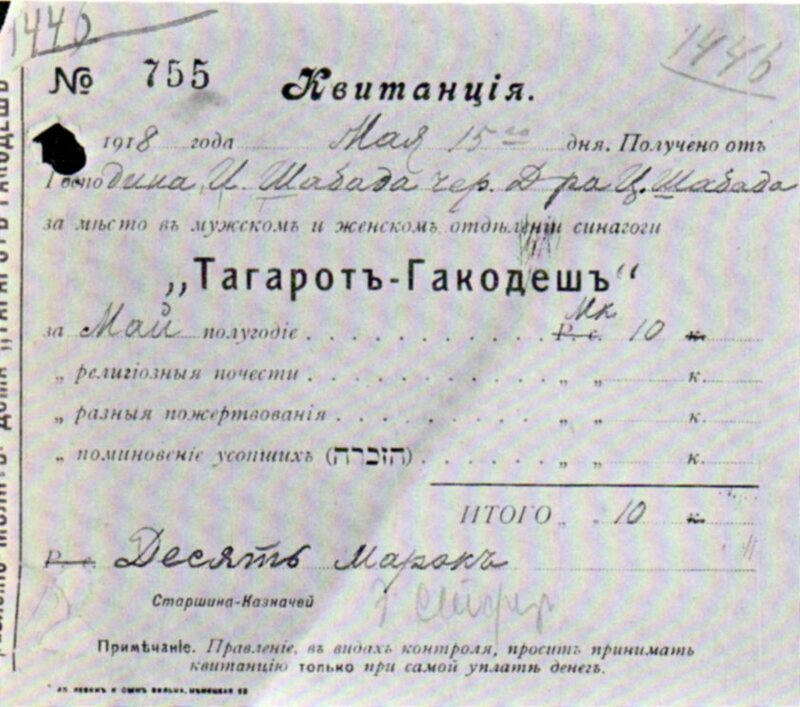 The establishment of a maskilic synagogue open to the public was a clear political, ideological and cultural statement, which showed the maturity of the Haskalah movement and its readiness to advance to the public space and to confront directly the conservative circles of the Jewish community. Soon after the establishment, the idea to build a separate building for the synagogue was articulated; however, as a Hebrew newspaper complained in 1867, “it costs much money". 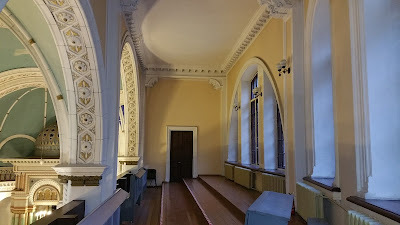 Various quarters served the congregation including a new synagogue in a rented house on Politseiskaia (today Arklių) Street, inaugurated in 1886. This, however, is described as a “narrow and short house, the women’s section is like a chicken coop;" hardly the modern and urbane image to which the adherents of the Haskalah Movement aspired. 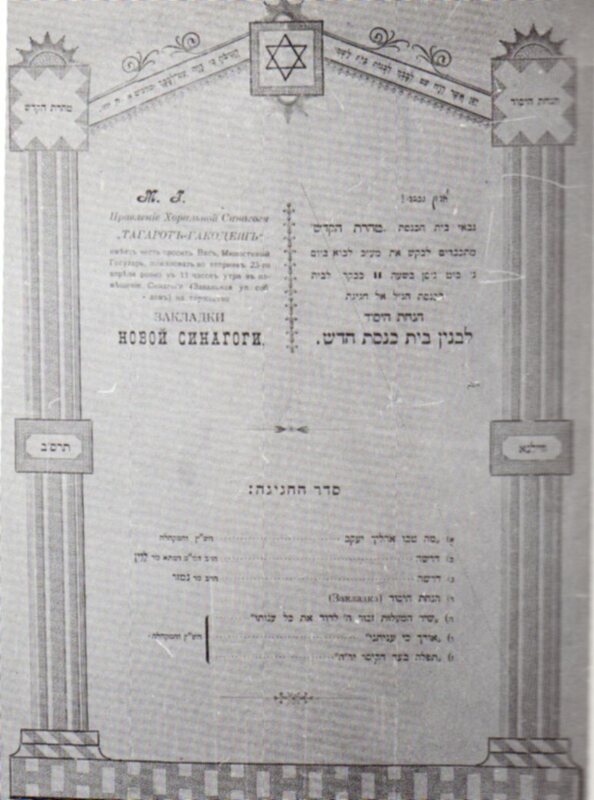 Finally, a house and an empty plot were bought in 1899 at 35 zaval’naia (today 39 Pylimo) Street, in order to build there the permanent synagogue; meantime, the temporary synagogue moved there. Vilnius, Lithuania. 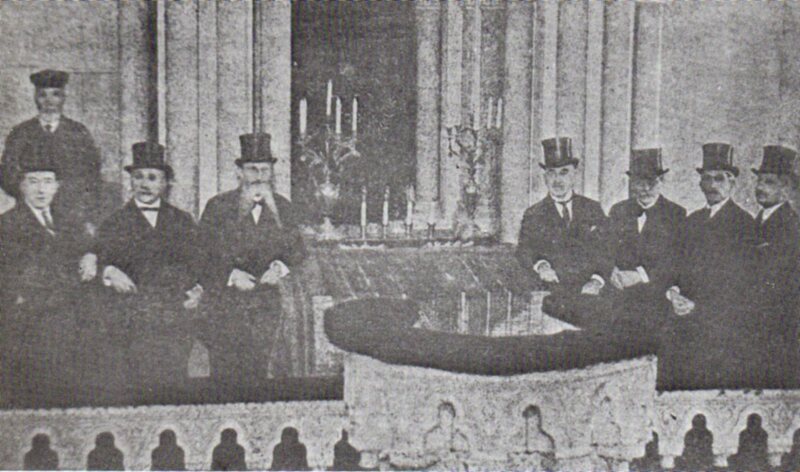 The administrators of the Choral Synagogue on the bimah (no date). Photo: L. Ran, Jerusalem of Lithuania, Vol. I. 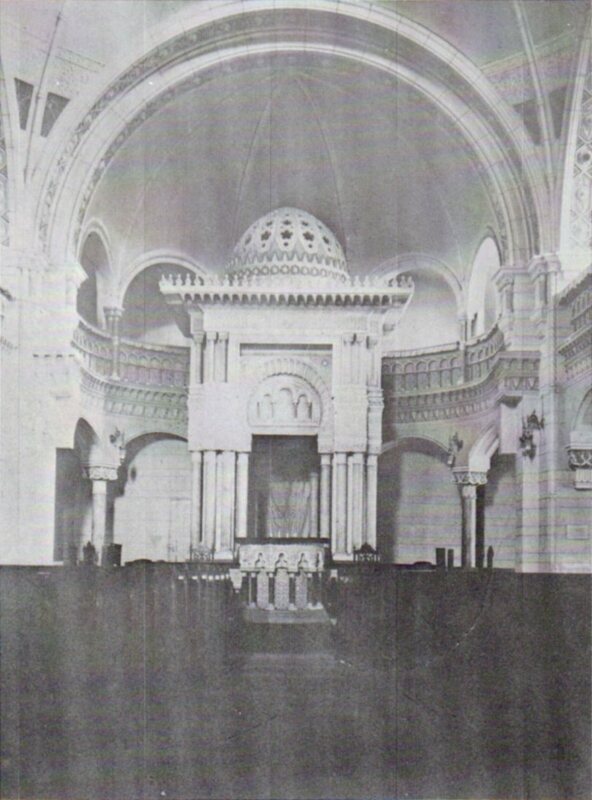 In 1901, architect Aleksei Polozov presented a design for an opulent choral synagogue, but in the end the synagogue was built following to a simpler plan by Jewish technician Daniel Rosenhaus. Polozov only supervised the construction. 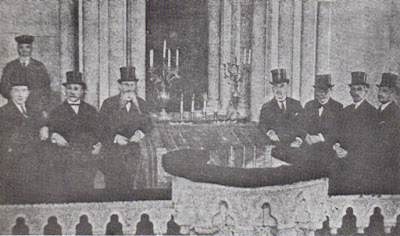 The cornerstone was laid on April 23, 1902. The first service in the synagogue was held on Rosh Ha-Shanah in September 1903, and the official inauguration ceremony was celebrated during the Hanukkah holiday three months later, in December 1903. 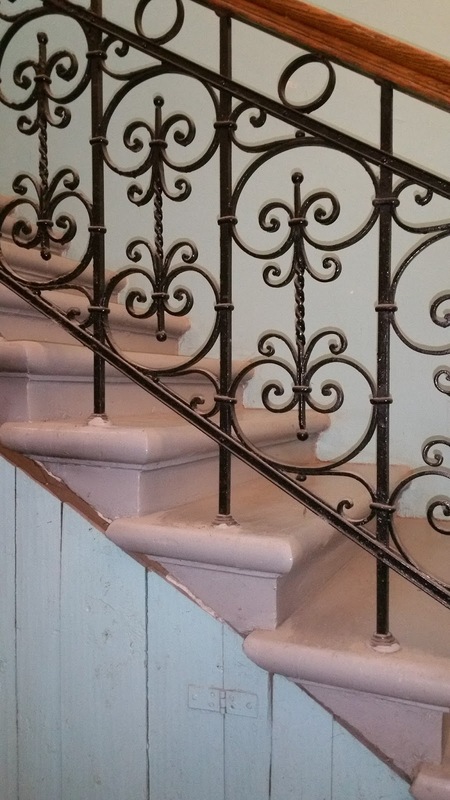 The new building had 350 seats for men and 200 for women, central heating and electric lighting. 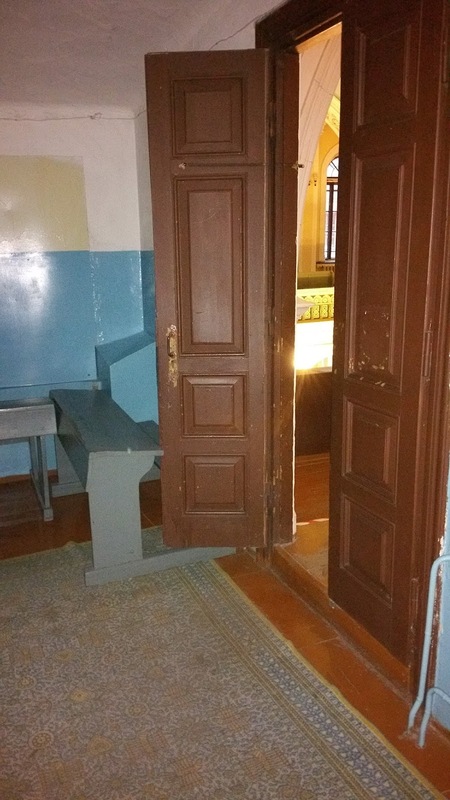 The building costs amounted to 45,000 rubles, and the Torah ark was donated by D. Lipski..However, the northeastern street façade of the synagogue was completed much later, in 1914 – as seen on pre1914 photograph. The congregation was never large. 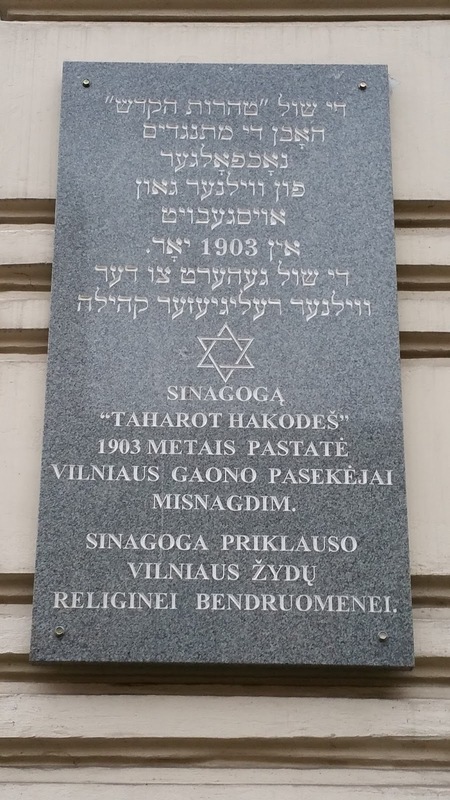 In 1933, there were only118 regular worshipers - a small number given Vilnius's still large Jewish population. The overall style of the building is Moorish, but with a Neo-Classical central window. This mix is not unusual for European synagogues - especially Progressive "Temples" at the end of the 19th century. The building tries to combine a dignified civic monumental with the more particular Moorish (or Oriental) features by-then recognized as Jewish. The main northeastern façade of the synagogue, facing Pylimo Street, is designed as an arched recessed portico, set between pylons and lateral low annexes, and beneath a gable surmounted by the Tablets of the Law. 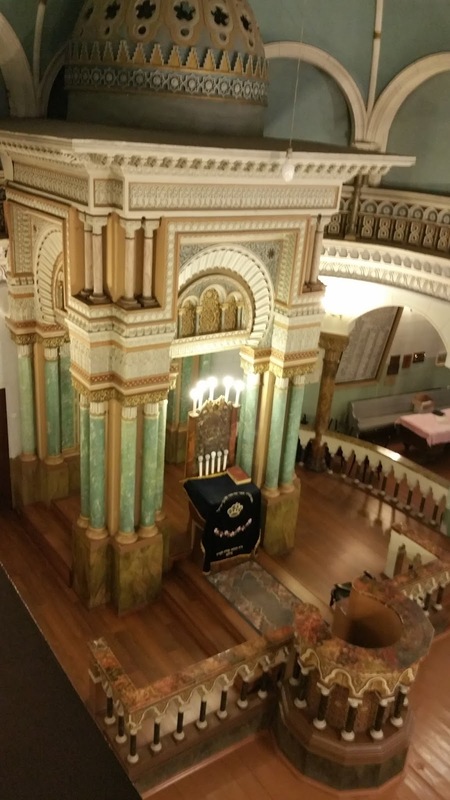 Inside, the vestibule and staircases precede the prayer hall; the direction towards the southeastern Torah ark is perpendicular to that of the entrance. The spacious first floor prayer hall is surrounded on three sides by women’s galleries. The Torah ark is preceded by a domed canopy decorated with colonettes, dentiled cornice and crenelation, all of which are set within a semicircular ambulatory. While certainly informed by previous examples of Moorish synagogue design, this small domed structure is essentially a transformation of the traditional four-column central bimah common Polish and Lithuanian synagogues from the 17th through the 19th centuries. Its form and decoration may also derive more directly from Ottoman shrines and covered pulpits known to travelers first-hand in this period. 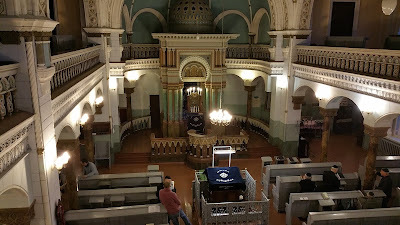 A pulpit for a preacher – a distinctive feature of a “progressive” synagogue – is situated in front of the ark. 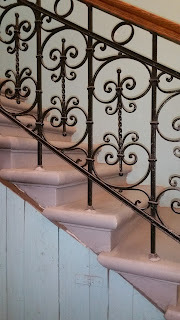 Today, a bimah is fenced by a metal parapet and situated in the midst of the pews. The first floor of the ambulatory served the choir. Four massive piers support the central cupola, while the women’s galleries and the choir rest on Alhambra-inspired columns. The hall is well lit by the large arched windows and by the skylight in the cupola, glazed with a Star of David design. There are several plaques - some taken from other synagogues. 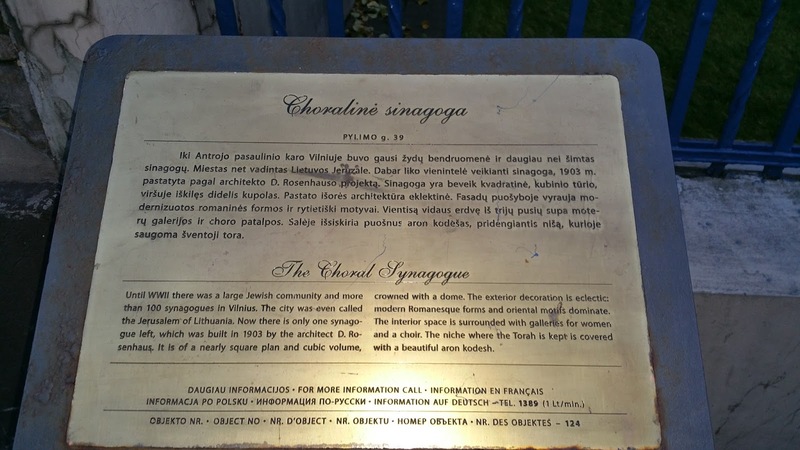 One was made after 1945 and includes the prayer in memory of the Jews who perished in the Holocaust as well as yahrzeit dates for the 125 Jewish communities in Lithuania. 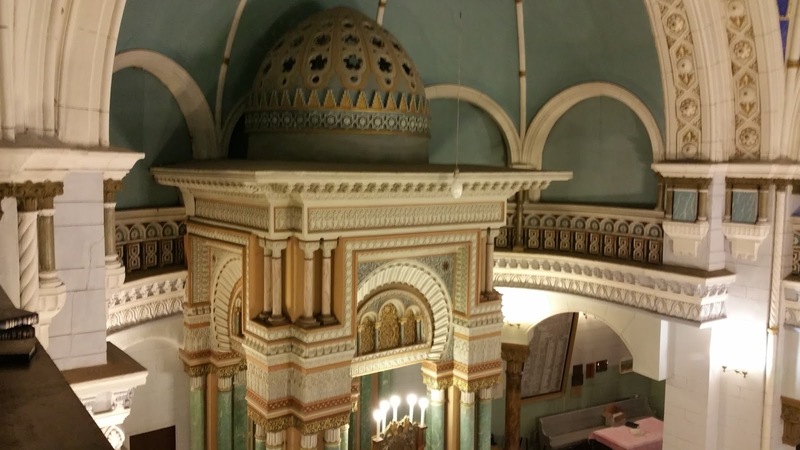 Thank you for this wonderful history of a very special synagogue. 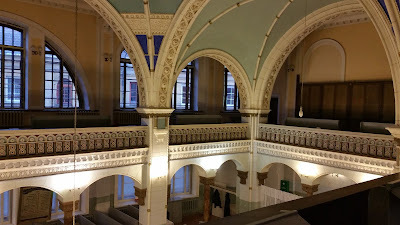 I was in Vilnius last year, and fortunately, I was able to gain access to the interior.